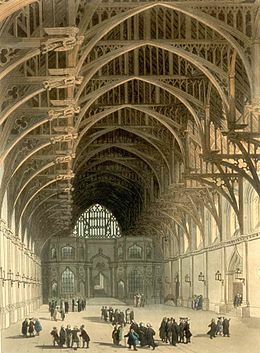 Westminster Hall and its hammerbeam roof, in the early 19th century. The Hall is the only original piece of Gothic architecture in the Westminster Palace. The rest is Gothic revival. The Palace of Westminster, also known as the Houses of Parliament or Westminster Palace, in London, is where the two Houses of the Parliament of the United Kingdom meet. In 1605, Guy Fawkes attempted to blow the Palace up. He was caught and later executed. This was called the Gunpowder Plot, and is celebrated on 5 November every year. The original building was used as a palace and home to the Parliament of England. After a fire in 1834, the building was used as a Parliament building. Westminster Palace, Westminster Abbey and Saint Margaret's Church make up a UNESCO World Heritage Site. Westminster Palace is an example of Gothic Revival architecture. ↑ "Palace of Westminster: Factsheet" (PDF). Restoration and Renewal. Houses of Parliament. Retrieved 13 September 2017. ↑ Historic England. "Details from listed building database (1226284)". National Heritage List for England (NHLE). Retrieved 9 July 2015. 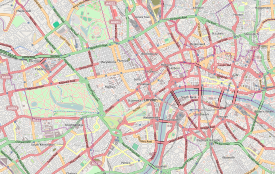 ↑ 4.0 4.1 UNESCO, "Westminster Palace, Westminster Abbey and Saint Margaret's Church"; retrieved 2012-4-21. This page was last changed on 3 October 2018, at 07:43.